France, 1934, 89 minutes, Black and white. Michel Simon, Dita Parlo, Jean Daste, Gilles Margaritis. Vigo made L'Atalante but was seriously ill, during the post-production he gave some instructions from his bed. However, he died before he could see the completed film. A biography of Vigo was made with James Frain by Julien Temple in 1998. The film was not well received at the time, was taken away and cut by twenty minutes and called The Barge Passes By, named after a song that was used during the film. It was somewhat restored in 1940 but still not popular. In ensuing decades, researchers sought out film so that they could put a final cut together which was achieved by the 1980s. 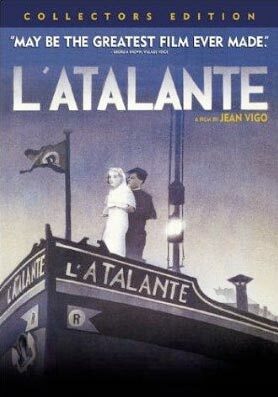 The film tells a simple story: Jean, who is in charge of a barge, marries Juliet. They travel down the canals, visit Paris where Juliet wants to see the city, Jean in pique leaves her. His assistant, the old Father Jules (Michel Simon) goes to find her. They are reunited. The importance of the film is in the cinematography, less reliance on dialogue and captions but the natural and realistic presence of the cast, the barge, the canals and the city of Paris. 1.The classic status of the film? In advance of its time in terms of cinematography, black and white photography, editing? Naturalism and performance? The cast? The musical score? 2.The history of the film, its being restored in the 1980s? 3.The black and white photography, the picture of the canals, the pictures of Paris, Le Havre? Realism? 4.The basic story: the barge owner, his assistant, the wedding, travel and work on the barge, the attractions of Paris, moods and anger, Father Jules and his superstitions and going to visit fortune tellers, continuing the journey without Juliet, arriving at the sea, Jules finding Juliet, the happy reunion? 5.The portrait of Jean, on the barge, his moods, love for Juliet, the wedding? The details of work? The interactions with Jules? The issue of superstition? Wanting to go to the city, Jules going out, their having to stay, Juliet going alone? The clashes? His breaking the plates? His leaving her behind? His regrets, the coast, the reunion? 6.Juliet, marrying Jean, life on the barge, her adapting, the hard work? The interaction with Jules and her finding him funny? The fight? The promise to visit Paris, her dressing up, her not being able to go? Her later going, the minstrel and the songs, the dancing, Jean watching? Her fascination, being left behind? At the wharf, trying to find accommodation? Jules finding her? 7.Jules, the old man, eccentric? Working with Jean? Interactions with Juliet? Working with the boy? The superstitions, his amulet, going to get his fortune told? With Jean, his going back to Paris and finding Juliet? 8.The boy, his work on the barge, working with Jules? 9.The scenes of Paris life, the crowds, people out for their walks, the clubs, the singers and dancing, the minstrel? 10.A glimpse of French life at the time?